The Canny Man’s is a pub in Morningside Road which is utterly unique and, some might say, eccentric. The walls are covered in all sorts of stuff, staff are dressed in black and white and they have a great selection of drinks. Morningside is an affluent area of Edinburgh and champagne sells well. If you read the reviews on e.g. Tripadvisor, some people seem to have had very bad experiences with unwelcoming and unfriendly staff. In many years of going there, we have never had such an experience – everyone has been friendly and helpful. We think it’s a great pub and go there regularly when we are in Edinburgh. Anyway, this blog is about food and the Canny Man’s specialises in open sandwiches – smorrebrod. We went there for a drink one Saturday evening, decided we were too tired to cook so stayed for dinner. I had two open sandwiches – they all have names which are hard to remember but, essentially, I started with smoked fish – salmon and haddock then followed this with a rare roast beef sandwich. Both were very nicely presented, with good quality ingredients and the service was impeccable. We were served a complimentary aperitif (pink wine) and digestif (Spanish brandy) with our coffee. This is a pub not a restaurant so you shouldn’t expect gourmet food. But 2 sandwiches are more than enough so you can eat a very good dinner for less than £20 each. I’ve written about Mezbaan before when we had a take-away meal from there but I’d never actually eaten in the restaurant. I went there with an old friend that I hadn’t seen for many years after we’d had a couple of beers in Bennets Bar. The food was as good as I had remembered – we had Wajid Ali – a chicken curry “cooked with Kashmiri deghi mirch, poppy seeds, fenugreek, aromatic spices and garnished with desiccated coconut and curry leaves” and Lamb Methi Gosht – Lamb with fenugreek, ginger, garlic and tomato. Rice and naan + (perhaps unwisely) more beer. Very friendly and efficient service. Highly recommended. Definitely one of the best (if not the best) Indian restaurants in Edinburgh. A little more expensive perhaps but worth the money. About £36 for two of us. A late Sunday lunch at this restaurant on the banks of the River Feugh near Banchory in Aberdeenshire. I’d walked about 13 miles from Aberdeen so this was very welcome. The restaurant is in a fantastic setting on the banks of the River Feugh, where you can eat on the balcony overlooking the river. Its geared to Sunday lunch – essentially, a variety of different roasts were on offer. I had chicken which was very flavoursome and Anne had roast beef. Other days, if I remember correctly, there is a wider menu. They were very busy and service was not quick although the staff were friendly and apologetic. The food is hearty rather than gourmet, which I appreciated after my walk. The cakes are reputedly excellent but we resisted the temptation. 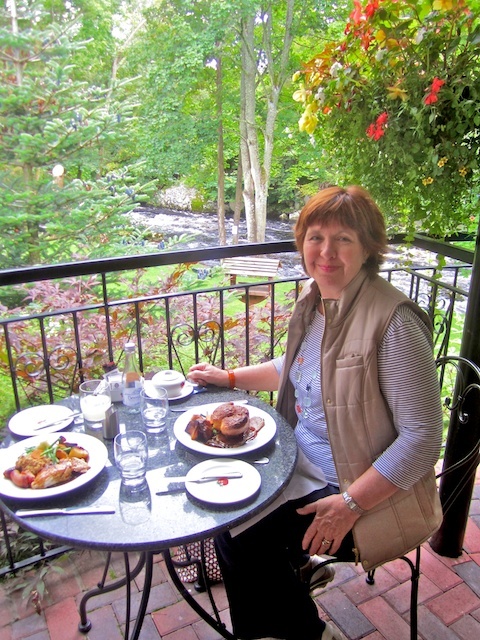 The food is fine but the setting is the main reason for going to the Falls of Feugh. I’d be happy to go back. We were about £15 each for lunch. The Bia Bistrot is a few minutes walk from our Edinburgh flat and I’ve written about it before in this post. We went again in early August with friends who were visiting from Northern England and the visit confirmed my opinions that you eat better in Scotland than France. I had a very French meal – Pork rilletes, cured cheeks and crackling to start followed by confit of duck with beans and tomatoes. I’ve had confit a couple of times in France and this was by far the best of them. Others in the party had coley – a sustainable fish – and were equally happy. For 4 of us, the bill which included a bottle of white and glasses of red wine came to £25 each. It was an excellent meal for the price.